Curwood Castle....a romantic reproduction of a Norman chateau. This photo was taken of Mr. Curwood and the castle, shortly after he built it in 1922 as a studio. James Oliver Curwood's home is on the northeast corner of Williams and Shiawassee Streets. The castle contains many of his original furnishings, copies of all his popular adventure novels and several oil paintings which serve as illustrations for his adventure stories set in the Canadian North. Many of his novels were later made into movies. One recent film that was produced from one of his novels was "The Bear", which had its U.S. Premier in Owosso. 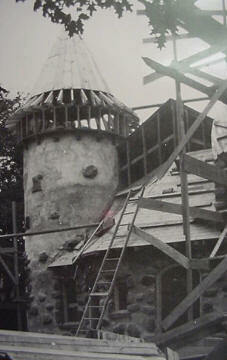 The photo above was taken during construction of the Castle. Jim Curwood was born in Owosso in 1878. 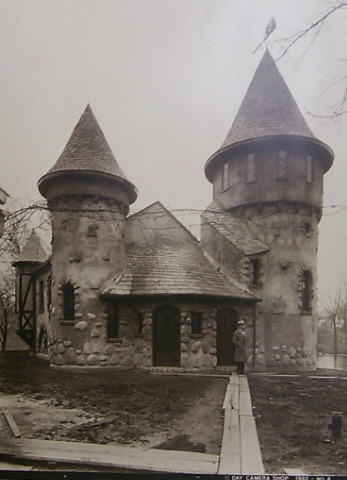 He built this replica of Norman chateau along the banks of the Shiawassee River near his home in Owosso in 1922 and 1923. The exterior is made of yellow stucco containing fieldstones he chose himself. The roof is slate with copper trim and the structure does not contain any eating or sleeping areas. He used the great room to entertain guests, including movie producers, and the largest turret as his writing studio. A hunter in his early years, he later became a zealous conservationist, appointed to the Michigan Conservation Commission in 1926. A year later he died. He stated in his will that the Castle was to be given to the City of Owosso. It has served in various capacities over the years and is now a museum operated by the city. The Castle is open to the public Tuesday - Sunday from 1 - 5. He was a press agent and propagandist for Canadas Department of Immigration for three years around 1908, and he did it for very low pay. One time he got into trouble because in one novel he had portrayed a Royal Canadian Mounted Policeman as not being an honest, upstanding man. There is no writing about the Royal Canadian Mounted Police after 1922. They are quoted as saying, Our records contain no information whatsoever about James Oliver Curwood. From 1908 to 1926 Curwood spent at least nine months each year in the woods. He built fifteen log cabins. His personal popularity abroad was never matched in Owosso during his lifetime. He died August 13, 1927 of blood poisoning. Ethel, his wife, moved to California. Jimmie Jr. was killed in a plane crash at Owosso Airport in May 1930. He had married Helen Wood of White Sulphur Springs. She lived with Ethel for a short time in Owosso. James Sr.'s daughter Carlotta died July 23, 1990, age 87. Curwood made nearly $1 million with only his pen...and a little imagination! "Nature is my religion. And my desire...my ambition...the great goal I wish to achieve is to take my readers with me into the heart of this Nature. I love it, and I feel that they must love it......if I can only get the two aquainted." James Oliver Curwood was born in Owosso, Michigan on June 12, 1878, the son of James M. Curwood and Abigail (Griffin) Curwood. Father Curwood was a cobbler and operated a shop in Westown Owosso until little Jim was six years old. At this time the family moved to a farm in Erie County, Ohio. He began to write stories at the age of nine and in 1891 the family returned to Owosso. Curwood attended Owosso's Central High School until he was in the tenth grade. He was expelled at that time. However, in spite of never completing high school, he passed the entrance exam and enrolled in the University of Michigan's English department to study journalism in 1898. Today it is much more difficult to be accepted at U of M.
Two years later he left Ann Arbor to become a reporter for the Detroit News-Tribune, to cover funerals, in which he was paid $8 per week. Six months later he was fired when he incorrectly reported a name in a story about a peeping Tom. Curwood joined a pharmaceutical manufacturer in which he was paid $50 per month. In 1902 he was re-hired by the Detroit News-Tribune for $18 per week and remained there until 1907. He left this position in order to devote more time to his writing. A few of his short stories were published while he was a teen, but he was not paid for these works. His first story to be sold was "Across the Range" for $5 to Gray Goose magazine. 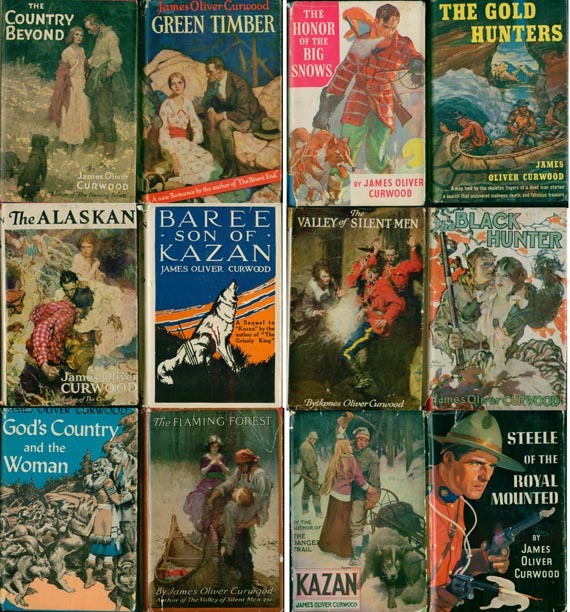 River's End was the first book to sell more than 100,000 copies in its first edition. In 1909, Curwood took his first trip into the Canadian Northwest. These trips would continue during the next 18 years, spending up to six months of each year in the wilderness, exploring, writing, and building log cabins. Drawing from his experience as a reporter following the Northwest Mounted Police through the icy regions of Alaska and Canada, he wrote in the woods, under a tree in Owosso's Harmon-Partridge Park, in his log cabins (including one built along the Ausable River near Roscommon which was eventually built into a lodge), at home, and at his studio castle. Upon his death, it was willed to the City of Owosso. 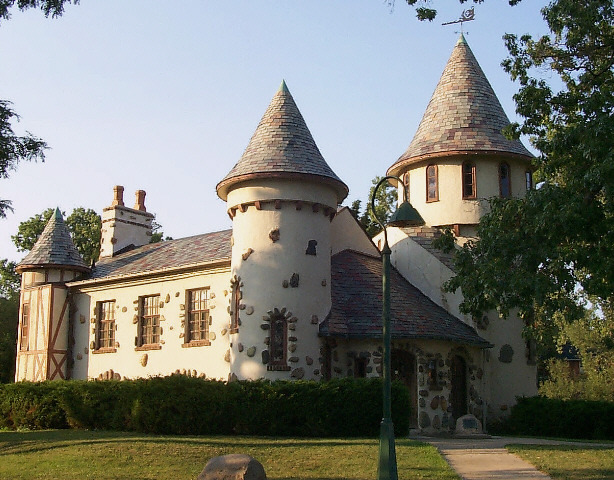 During World War II, Curwood Castle was used as a youth center; the Owosso Board of Education had its offices there until about 1969 and since November 1970 has been used as museum to house Curwood memorabilia. In 1900 Curwood married Cora Leon Johnson. They had two children--Carlotta and Viola before they divorced eight years later. In September 1909 he married Ethel Greenwood and they had a son, James, Jr. Cora was given custody of their two daughters although Carlotta lived in Owosso with her father. Curwood was an avid hunter until about ten years before his death. While on a hunting trip in the Rockies, he saw a large bear he called Thor. He tried to shoot him three times in three weeks. One day as Thor approached him, he slipped and fell, breaking his gun. The bear reared up before walking away. Curwood turned from hunting for trophies to championing the cause of wild things. His philosophy was to lead to his active campaigning for the preservation of Michigan's natural resources. He wanted to limit or even close hunting seasons, including the season for spikehorn deer and was always interested in stocking streams and game preserves, as well as reforestation. On January 1, 1927 he was appointed to the Michigan Conservation Commission. He was also instrumental in planning and building the Shiawassee Conservation Club. Unfortunately, after his death most of the measures he had fought for were revoked. Curwood had planned to live to be 100 by eating little meat, drinking no coffee, tea, or liquor, and exercising regularly. Instead, he died at the age of 49 on August 13, 1927 at his home. While fishing near Venice, Florida, something bit or stung him on his thigh, in or through his rubber boots. It was first thought to have been a spider, but was never verified. According to a letter from his daughter, "He had an immediate reaction to this and was given different antitoxin in an effort to offset the reaction". These treatments did not seem to work so Curwood had his driver take him back to Michigan. The spot where he was stung formed something similar to a carbuncle. This was lanced and treated eight times. He called in Dr. J. J. Haviland, as he was suffering from a severe sore throat. Dr. Haviland called in Dr. Harold A. Hume as a consulting physician later when his illness became more severe. Dr. Haviland ordered complete bed rest, but Curwood, who was scheduled to testify before the State Legislature on behalf of conservation, said that his thirty years of efforts in this regard was "culminating in the hearings and that he had to go". The infection had spread throughout his blood stream and he died a few days later. 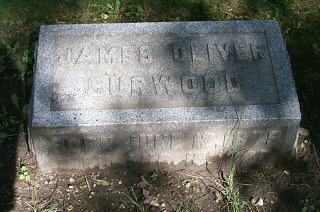 James Oliver Curwood is buried in Oak Hill Cemetery at Owosso, Michigan. Dorothea A. Bryant was not one of JOC's secretaries and he probably never even knew her. She was hired after his death by the Estate to finish up some things, "Green Timber" being one of them. She lived on Long Island, NY. Green Timber was completed and published, but originally it was known as Whip-Poor-Will or A Poet--And a Sinner. The James Oliver Curwood Cabin. This building was used in the 1920's by the famed Michigan author and is located in Baraga County. The cabin was moved from its original site in the Arvon (Skanee) area by the Baraga County Historical Society in the early 1970s to the L'Anse Township Park. The Park was rename the Curwood Park. The cabin was dismantled in 1998, and will be relocated to the Society Museum site in Baraga. It was here that the author wrote one of his books, "A Gentleman of Courage".